Bulldog Dogs - Bulldog (lat. Canis familiaris) also known as the English Bulldog or British Bulldog is a medium-size breed of dog that originated in England. The bulldog is a relatively small but stocky breed, with a compact body and short, sturdy limbs. Its shape results in a waddle-like gait. Bulldogs are known for their short muzzles and the saggy skin on their faces, creating the apparent "frown" that has become a trademark of the breed. This information is licensed under the GNU Free Documentation License. It uses material from the Bulldog article on Wikipedia.org. Bulldog Breeders - Advertise your kennel puppies and dogs here. Country Charm English Bulldogs - Missouri - Our English Bulldog puppies are full AKC registered and are raised in a clean healthy environment. Cherishabull Bulldogs - Florida - We breed champion bloodlines in our AKC registered bulldogs. We have over 10 yrs. experience with bulldogs and raise our bullies in our loving home. Dixie Bulldogs - Alabama - Breeding AKC registered English Bulldogs. J & J Bulldogs - Alabama - Always breeding for the betterment of the breed, and striving to produce top quality AKC Bulldogs. MonAmine Bulldogs - Florida - Breeding top quality show prospect and pet quality bulldogs out of top lines. Many years experience in breeding and showing. Champion sires. Renaissance Bulldogs - Florida - Pet and show prospect puppies available occasionally throughout the year. We strive to produce healthy and social puppies with great temperaments and conformation. We take pride in sending our puppies into loving homes where they will make a wonderful addition to your family. 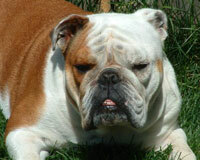 Superstition Bulldogs - Arizona - Breeding AKC English bulldogs stricly for health and temperment. Home raised, excellent bloodlines, health guarantee. Chubby Cheek Bulldogs - The Philippines - English Bulldog Breeders. We offer excellent quality pups and adults on occasion. Champion Bloodlines. Worldwide Shipping and Export Pedigree available. Thompson's Bassets and Bulldogs - Alabama - We raise and show AKC English Bulldogs, our kennel is located in Locust Fork, Alabama. Please take a few minutes to browse through our website.